Wish that you could be like the cool kids? Thrilllist.com, that lover of lists, has named “the coolest guy from every state,” and the Colorado honors go to “South Park” co-creator Trey Parker. Check out the other cool kids at www.thrillist.com/travel/nation/the-coolest-guy-from-every-state-frank-sinatra-elvis-miles-davis-and-more. Beer here? Which state is tops on Thrillist’s list? “It’s a great time to be drinking beer in America. Not that it was ever, you know, a bad time to be doing that necessarily, but with craft breweries multiplying like rabbits who’ve been drinking beer, you can literally find some serviceable (if not downright tasty) local brews in all 50 states. Which made the process of ranking them all the more difficult, but we were up to the challenge, especially since it meant drinking and thinking about beer for weeks straight. “Here they are, all 50 states in the Union, ranked according to their beer. A couple notes about our criteria. Quantity and quality are both important, but quality’s a bit more important. If you’re a small state turning out a disproportionate amount of great beer, it did not go unrecognized. We also gave a boost to states who played a historical role in American beer as we know it today. Check out all the rankings at www.thrillist.com/drink/nation/every-state-in-the-usa-ranked-by-its-beer. Spoiler alert: Mississippi came in dead last. In honor of Colorado’s 138th birthday, History Colorado museums will be free to the public Aug. 1 and 2, offering visitors two days to celebrate Colorado’s wild, colorful, historical, traditional and modern culture. The two-day Colorado Day celebration at the History Colorado Center, 1200 Broadway, will include food, music, dance and hands-on activities as well as a chance to recognize how Colorado’s past has shaped today. Beginning at 8 a.m. Aug. 1, History Colorado and its partners, the Department of Agriculture, the Colorado Department of Military and Veterans Affairs and Visitor Services will meet on the west steps of the Capitol to honor the occasion. The Capitol will be decorated for the event, and will feature square dancing, Colorado candy and birthday cake, living history preservation and other special programs, followed by a procession from the Capitol to History Colorado. Colorado Proud will hold a press conference at the History Colorado Center immediately afterward to recognize Aug. 1 as Colorado Day and to launch the Colorado Proud Choose Colorado Tour – a month-long, statewide road trip to celebrate food and agricultural products that are grown in Colorado. The Choose Colorado Tour, scheduled from Aug. 1 through 27, integrates 10 agricultural communities, celebrates farmers who help our state thrive and educate and influence consumers along the journey. History Colorado Center festivities include an indoor/outdoor farmers market featuring local farms and Colorado Proud products, getting dirty with adobe brick making, craft and food demonstrations, and live performances all day long. These festivities are presented in partnership with the Colorado Tourism Office and AngloGold Ashanti North America Inc. In addition, the much renowned traveling exhibit Food: Our Global Kitchen will be open throughout August — the last chance Coloradans will have to see, touch, and taste this exhibit before it travels cross country. History Colorado, a Smithsonian Affiliate, is on Facebook.com/HistoryColorado and on Twitter@HistoryColorado. For more information visit www.HistoryColorado.org, www.HistoryColoradoCenter.org, or call 303-447-8679. Any doubt which state has America’s most favorite mountain towns? Not to those of us who live in and love the great state of Colorado. But Travel + Leisure magazine has legitimized what those of us in the know have known all along in its list of America’s 20 Favorite Mountain Towns. Aspen’s No. 1 and Estes Park is No. 2. Moving down the list, Telluride took No. 5, Boulder boasted No. 6, Snowmass Village ranked No. 12, hooray for Ouray at No. 13, Leadville lept to No. 14 and Breckenridge completed the Colorado contenders at No. 17. Check out the rest of the picks at www.travelandleisure.com/articles/americas-favorite-mountain-towns/2?xid=JustIn061714FavoriteMountainTowns. The Westin Riverfront Resort & Spa at Beaver Creek Mountain is hosting Karina Smirnoff – world champion dancer from the hit show “Dancing with the Stars” – in her first Colorado engagement with a three-day DanceFIT-KS Workshop Friday through Sunday. Beauty and lifestyle expert, television star Smirnoff is one of the most successful dancers in the world as a choreographer on ABC’s global hit dance show in its 18th season. Smirnoff’s DanceFIT-KS is a customized, unique fitness experience that is open to everyone – singles and couples of all ages and fitness levels. * Friday – 6 p.m. meet and greet cocktail party and photo opportunity with Smirnoff at The Westin Riverfront, featuring a performance by Celebrate the Beat students. * Saturday – 9:30 – 10:30 a.m. salsa class; 11 a.m. – noon shape up DanceFIT-KS cardio class; 6 p.m. – special screening of “Across Grace Alley”, followed by a Q&A session. * Sunday – 9:30 – 10:30 a.m. Cha Cha dance class. The Westin Riverfront Beaver Creek is offering three unique ways to experience Smirnoff this summer. Each of the packages will include a donation to The Vail Valley Foundation’s Celebrate the Beat program, which is a contemporary dance program for school children ages 5-12. The three-day DanceFit-KS program is $185 per person. The Karina Smirnoff Weekend Experience is $229 per person per night with a two-night minimum stay. This package includes: The three-day DanceFIT-KS program, accommodations in a studio suite and valet parking. The Ultimate Dancing with Karina Smirnoff Package: $379 per person per night, with a two-night minimum stay. This offer includes: Full access to the three-day DanceFIT-KS program; a spray tan; manicure, pedicure and makeup application; massage at Spa Anjali; accommodations in a studio suite; a wine amenity and valet parking. To book your Beaver Creek Karina Smirnoff weekend, call 970-790-2000 or visit www.westinriverfrontbeavercreek.com .To book just the Karina Smirnoff Workshop, call the Athletic Club at The Westin directly at 970-790-2051. 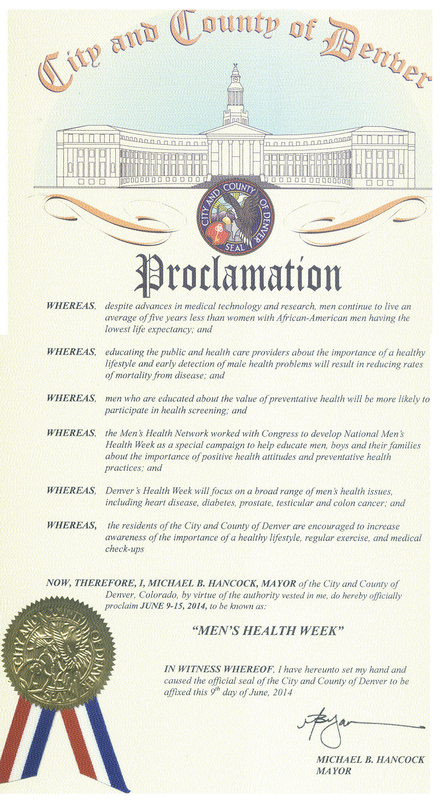 Governor John Hickenlooper, Denver Mayor Michael Hancock, and Aurora Mayor Steve Hogan have issued proclamations declaring the week that ends on Father’s Day, June 9-15, as Men’s Health Week. This awareness period is part of a national effort to celebrate fatherhood while helping to educate men, boys and their families about disease prevention, medical screenings and living healthy lifestyles. 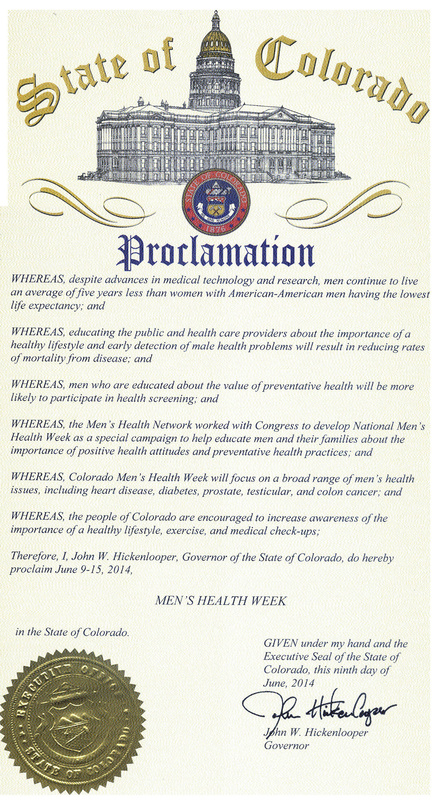 This year marks the 20th anniversary of the establishment of National Men’s Health Week. The legislation was sponsored by Sen. Bob Dole and Congressman Bill Richardson and was signed by President Bill Clinton on May 31, 1994. According to the National Center for Health Statistics, men have higher rates of death from cancer, diabetes and heart disease. Moreover, the Centers for Disease Control and Prevention reports women nationwide are 100 percent more likely to visit their doctor for annual exams and preventative services than men. 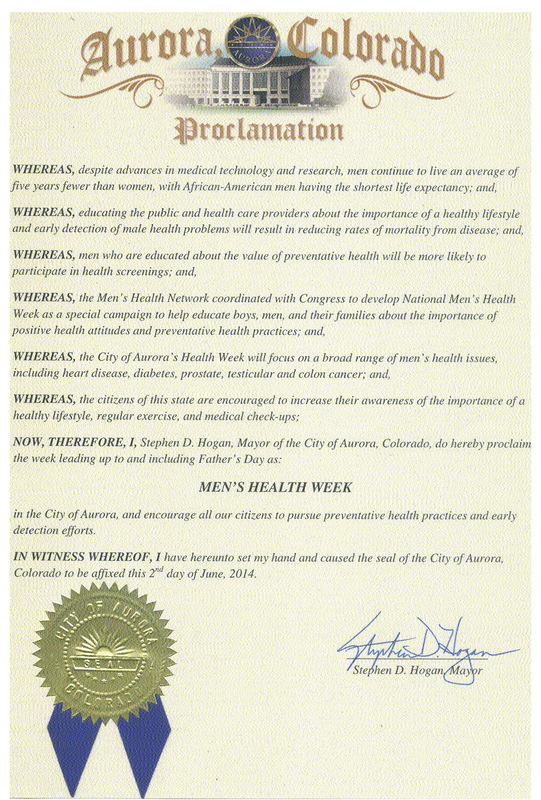 In preparation for Men’s Health Week, MHN encourages health care professionals, private industry, faith-based organizations, community groups and other interested organizations and individuals to plan activities and events which focus on men’s health during the week of June 9-15. For ideas and open resources in both English and Spanish, visit www.menshealthmonth.org. Pat Hamill, dandy Denver developer and founder of Oakwood Homes and owner of Green Valley Ranch Golf Club, has acquired the assets of Henry Walker Homes for Oakwood Homes’ continued expansion in the Utah market. Henry Walker Homes was seeking a new capital partner with a similar organizational culture. Oakwood Homes, Colorado’s largest private homebuilder, purchased Henry Walker Homes for upwards of $75 million. Värde Partners and Mountain Real Estate Capital provided the capital for this transaction. Oakwood Homes and Henry Walker Homes began discussions in September 2013 and completed the transaction on April 23 this year. Henry Walker Homes currently operates in Northern Colorado and Northern and Southern Utah. Oakwood Homes operates in the Colorado Front Range, including the Denver metro area and Colorado Springs; Omaha, Neb. ; and northern Utah. This acquisition will mark the expansion of Oakwood Homes into northern Utah, including Salt Lake City. Henry Walker Homes’ operations in southern Utah and Colorado will resume under a different name. “When presented with the opportunity to acquire Henry Walker Homes, we were immediately intrigued,” Hamill said. “We were expanding into Salt Lake City, and Henry Walker is already established in Utah with a solid reputation in the area. This opportunity allows us to leverage our strong capital foundation and our efficient building practices towards our vision of being the best homebuilder in America. The operations in Utah will take place systemically over the next year. 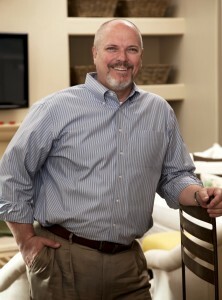 John Stubbs, the current President of Henry Walker Homes, will become President of Oakwood’s Utah Division. Mike Stewart will lead the integration team. Over the next year, Jason Chisholm will be Vice President of Operations, and James Doolin will be Vice President of Land Acquisition. Stubbs will partner with the integration team to ensure that the process and systems are successfully integrated over the next year. Oakwood Homes employs 151 people, and Henry Walker Homes has 78 employees. The majority of associates are expected to remain in their current roles. 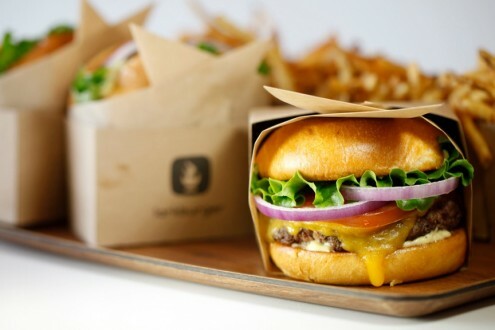 Larkburger, the popular local burger joint, has been getting lots of tweets from Colorado students attending colleges out of state hoping for a Larkburger being sent to their dorm. So, Larkburger teamed with Frontier Airlines to bring a Colorado student back for a taste of home. To enter Craving Colorado, which launched Tuesday, entrants must submit a video via Larkburger’s Facebook page (or post to Instagram and Twitter using #CravingColorado) in which they explain what they miss about their home state. The winner will receive a free meal at Larkburger, $300 toward a Frontier Airlines flight and other Colorado goodies. Sounds a lot like those days when college kids would cross state lines to buy cases of Coors beer? Guess Larkburger is keeping up a Colorado tradition.